Police in Paris have used tear gas to disperse a crowd of protesters who turned violent and clashed with authorities over the killing of an Asian man over the weekend while also denouncing overall police brutality in the country. Police intervened to disperse the crowd shortly after 11 pm local time. Tear gas was shot during RT's live broadcast from the scene in Paris’ 19th district where police faced off with the local Asian community for the second night running. Footage from the site shows police in riot gear trying to quell protesters. Hundreds of people converged on the streets of Paris on Tuesday to speak out against police brutality. Activists and members of the Asian community marched in the vicinity of the police station of the 19th arrondissement for several hours before the violence erupted. — RT (@RT_com) 28 марта 2017 г. — Jonathan RT France (@Jonathan_RTfr) 28 марта 2017 г. The incident has sparked a diplomatic row with Beijing. On Tuesday, the Chinese Foreign Ministry summoned a French diplomat and urged the French authorities to investigate the killing thoroughly and to ensure the safety of Chinese nationals on French soil. 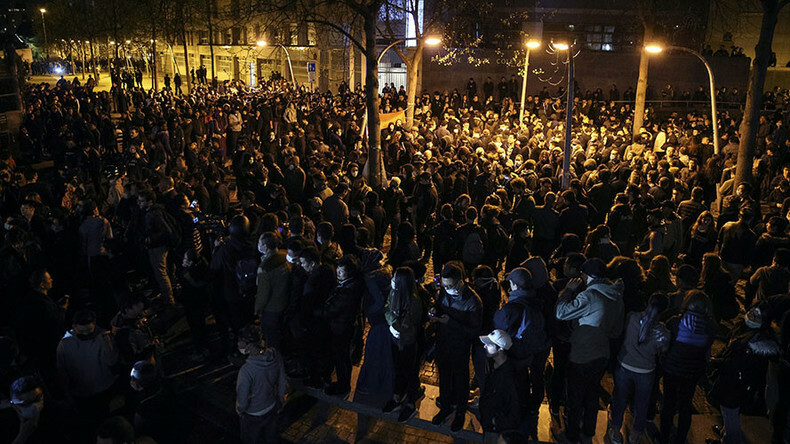 Until the first projectiles were thrown at officers late evening, the gathering was relatively calm with some 500 people lighting candles and chanting “Assassins!” “Truth!” and “Demand justice!” Le Parisien reports. Monday night’s protest unfolded similarly with clashes resulting in the arrests of 35 people.